The time has come for the good people of South Carolina to band together and let our legislators know that we are committed to voting district lines that ensure FAIR representation for all our citizens. We want every vote to count! We must know what we want and we must pay attention and we must act again and again delivering our message. 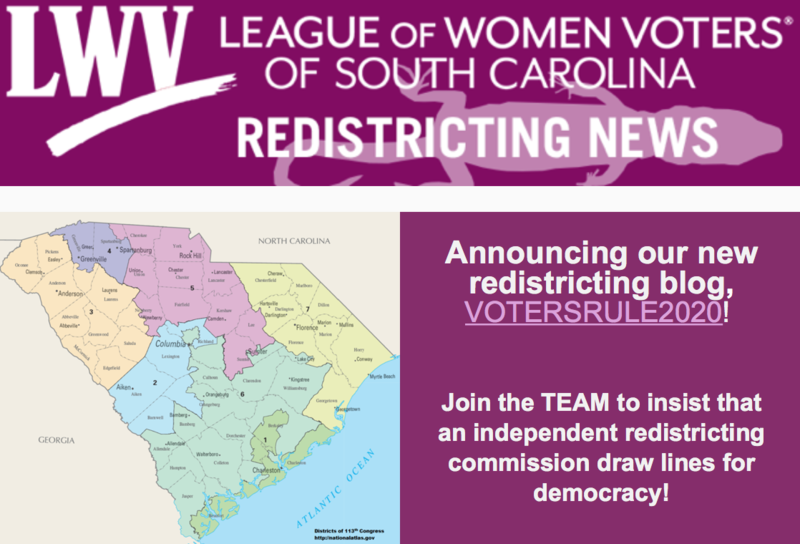 To put it simply, we want a South Carolina Redistricting Commission and clearly defined criteria that new redistricting maps must meet. In 2020, the census will be counting our citizens, and in 2021, a Redistricting Commission will be re-drawing our election district lines. We want that Redistricting Commission to use an open, transparent process that will make democracy work in South Carolina. And so we must take this message to our legislators OVER and OVER again until they realize that we are not going away! We must create a groundswell of public opinion so that our legislators will listen to us. Twenty-two states have some type of independent redistricting commission; we want to be the 23rd! So, will you join us? Sign up to follow this blog, VotersRule2020, and you are on the TEAM. When we need action, you’ll know it and you’ll be part of making democracy work right here and right now. Onward!